We had a check-up with the neurologist today down at PCH. Which meant the inevitable task we'd been dreading had finally come: having to feed Evelyn "out in public" with her feeding tube. Now, it wasn't really the "public stigma" or "embarrassment" factor causing this fear - I'm not entirely sure that'd bother us much anyway, but even if it were to - c'mon; this was the hospital we were at. No, it was the fear of the logistics involved with such a task. The pump, and the feeding bag, and the formula, and the syringe to flush the tube, and the medicine for her 2:00 Depakene dose, .... daunting, to do it "outside the house" for the first time, to say the least. So, Kim dutifully packed everything up, picked me up from the office, and we headed on down to the hospital. We had our meeting with the neurologist at 1:00pm (more on that in a later post), and then it was time for Evelyn's 2:00 feeding. So, we went down to the lobby of the outpatient building, and set up. Kim pours the formula in the newly-unsealed bag, and..... Yep; Mr. Murphy visited, and the bag had a leak. At this point, we were a bit stressed - what do we do now!?!? 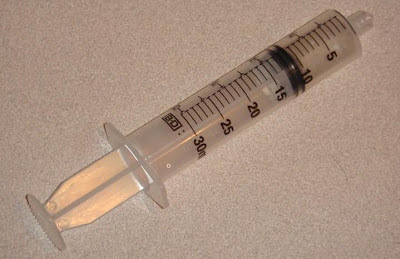 We left The Big Syringe - to pump food in manually - at home! We had no other way to get the food in, except via the pump that needed a bag that had a leak! While I held a growing-fussier-by-the-minute Evelyn and schemed on patching the leak up with chewing gum, duct-tape, and/or bailing wire, Kim went around to see if she could find another feeding bag - we were at a hospital, after all! Luckily, she found another mom with a child being fed via feeding tube as well, who had a spare big syringe, just in case. I then hand-pumped in 2.5mL every 30 seconds for 120mL (that's 24 minutes). ;-) While an onerous task, it wasn't so bad, and probably beat the chewing gum, duct-tape and bailing wire solution I had drawn up.